This Induction Type Directional Power Relay operates when power in the circuit flows in a specific direction Unlike a non-directional overcurrent relay, a directional power relay is so designed that it obtains its operating torque by the interaction of magnetic fields derived from both voltage and current source of the circuit it protects. Thus this type of relay is essentially a wattmeter and the direction of the torque set up in the relay depends upon the direction of the current relative to the voltage, with which it is associated. Constructional details: Fig. 21.18 shows the essential parts of a typical induction type directional power relay. It consists of an aluminum disc which is free to rotate in between the poles of two electromagnets. The upper electromagnet carries a winding (called potential coil) on the central limb which is connected through a potential transformer (P.T.) to the circuit voltage source. 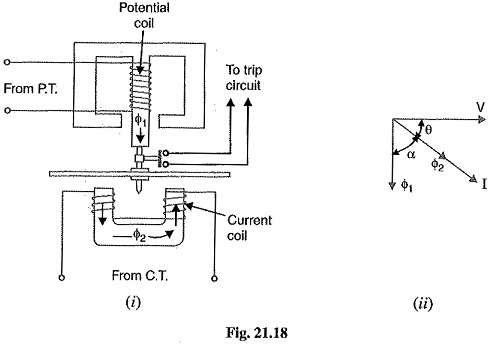 The lower electromagnet has a separate winding (called current coil) connected to the secondary of C.T. in the line to be protected. The current coil is provided with a number of tappings connected to the plug-setting Midge (not shown for clarity). This permits to have any desired current setting. The restraining torque is provided by a spiral spring. The spindle of the disc carries a moving contact which bridges two fixed contacts when the disc has rotated through a pre-set angle. By adjusting this angle, the travel of the moving disc can be adjusted and hence any desired time-setting can be given to the relay. Operation: The flux Φ1 due to current in the potential coil will be nearly 90° lagging behind the applied voltage V. The flux Φ2 due to current coil will be nearly in phase with the operating current I. It is clear that the direction of driving torque on the disc depends upon the direction of power flow in the circuit to which the relay is associated. When the power in the circuit flows in the normal direction, the driving torque and the restraining torque (due to spring) help each other to turn away the moving contact from the fixed contacts. Consequently, the relay remains inoperative. However, the reversal of current in the circuit reverses the direction of driving torque on the disc. When the reversed driving torque is large enough, the disc rotates in the reverse direction and the moving contact closes the trip circuit. This causes the operation of the circuit breaker which disconnects the faulty section.